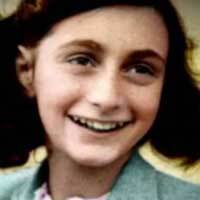 "...I remember reading The Diary of Anne Frank (the book, not the play) in my early teens and crying. Decades later I heard a new, unedited version of the book had been released--one with slightly more disturbing, more complex content (we are talking about the innermost thoughts of a pre-teen then early teen after all, under far more than usual stress). The play being done now in Hollywood is based on this new (or if you prefer, original) version. Written by Wendy Kesselman, based on the original play by Frances Goodrich and Albert Hackett." "...Director Stan Zimmerman's inspiration for the production came from a CNN story about a Jewish woman who provided haven for an undocumented Latino family. His reimagining of the play utilizes Latino actors in the role of Dutch Jews, which undoubtedly creates stark resonance, and some problems as well. The play begins as a staged reading of the original, with cast members reading from scripts. This goes on for over a half an hour, and it's initially puzzling, then becomes somewhat of a distraction. Eventually the scripts are discarded, the actors become their characters, and the play unfolds." "...It's unclear if it is the new material in the script or the choice the director and Ochoa made in playing the role, but Anne comes off as much more of a peevish brat here than in previous productions this reviewer has seen. As a result, it is difficult to feel warmly towards her. The cacophonous staging of the arrest also masks one of Anne's most memorable lines "In spite of everything, I still believe people are good at heart." The performances of the balance of the cast never rise much above that original staged reading vibe. The only performer to make an indelible impression is Raquenel as Mrs. Van Daan. Granted it is a great role, the one that won Shelley Winters her first Oscar, but Raquenel truly makes the role hers and owns every scene she is in." "...Stan Zimmerman's production of The Diary of Anne Frank was embroiled in controversy before it even opened, due to outraged reporting on the casting of Latinx actors in the roles. The production was inspired by a CNN report on a safe house in L.A. where a Jewish family was protecting a Latina mother and her daughters after her husband was deported by ICE. Zimmerman immediately made the connection to Anne Frank, and obtained the rights, only to be meet with contention as soon as rehearsals began."